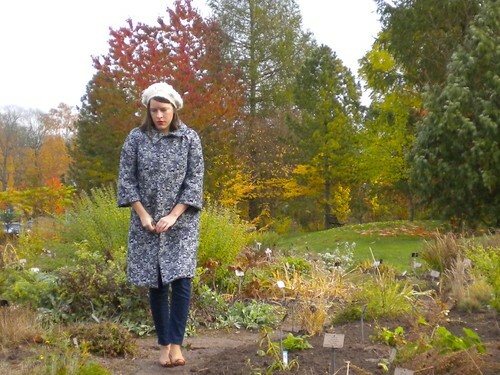 Pattern Review: BurdaStyle Magazine 03-2010-101A aka The Summer Coat. My initial idea was to make it out of linen, or something neutral colored, but when I stumbled upon this fabric when I visited a friend in Paris in June, I was sold. The fabric, together with the style of coat is a wee bit over the top, and must be carefully teamed with other garments to not look crazy. We discussed this during SSS, you know, where do the line go between “retro vibe”, and “costumey”? I guess it´s all about accessorizing, and how a garment is worn, as well as that my own personal style limits are pushed further and further the older I get. :-) How do you resonate about incorporating vintage looks into everyday outfits? Pattern Description: Raglan sleeves, large Peter Pan collar and 7/8 sleeves. Fully lined and with welt pockets. Did it look like the photo/drawing on the pattern envelope once you were done sewing with it Yup. Pretty much. Were the instructions easy to follow? As per usual, I had my Vogue Sewing handbook at hand at all times when things got confusing in the pattern instructions, mainly for the welt pockets and the collar attachment. What did you particularly like or dislike about the pattern? I really love the simplicity of the pattern and the clean lines. I also adore the collar, and the sleeve length. What´s not to like? Fabric Used: I used a cotton jacquard I got at Les Coupons de St. Pierre in Paris. 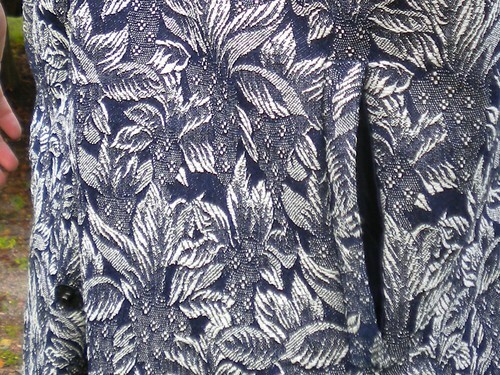 The fabric is navy blue and silver, and is actually equally gorgeous on the wrong side of the fabric. I had some initial thoughts about leaving it sans lining, but then thought I would get more wear from it if I did line it. The lining fabric is a navy rayon lining. Pattern alterations or any design changes you made: I did a FBA on the bust dart. Otherwise, the only design detail I changed was to not roll up the sleeves. Out for a stroll in the Botanical Gardens. Would you sew it again? Would you recommend it to others? If I need this type of coat again, I will definitely pull out this pattern. 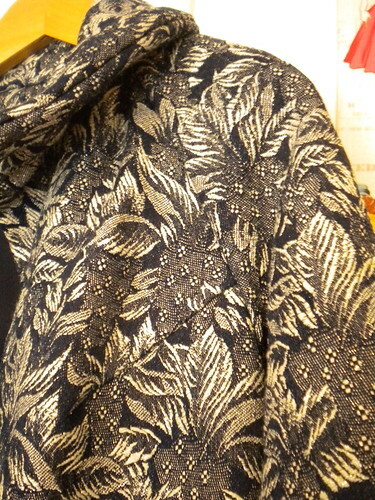 The jacquard is rather stiff, but I imagine this coat getting a completely different look in a more flowy fabric. I can absolutely recommend this to others! 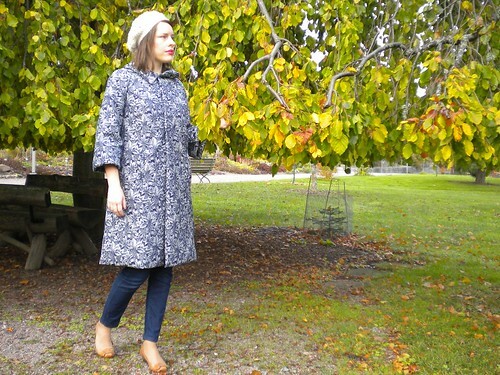 Conclusion: A pretty, easy to make coat in an over-the-top fabric for those days when a little dressing up is in order! Wow, that fabric is gorgeous! I don’t think it’s over the top at all, looks great on you! Gorgeous, Solvi! I love the print and the length of the sleeves – very elegant! Solvi, this is beautiful. I love the silver and blue pattern and don’t think it’s too crazy at all. Then again, my style limits are definitely being pushed as I get older as well! In my opinion, this coat is absolutely fabulous. Great job, it looks perfect for your needs! It’s beautiful, Solvi! Well done! Gorgeous! It’s got such a wonderful vintage vibe and what an incredible fabric. Indeed, I can see this being a great coat year-round (as you said, depending on layers!). And kudos to you for the welt pockets! I am losing steam on the blazer I’m working on which had welt pockets, and I just didn’t have the mojo to make them 🙁 Patch pockets to the rescue! I love your coat! The fabric is gorgeous. Wow, great fabric! I really like the silhouette, sort of late 50s, early 60s. You need some long gloves with a cocktail ring to go with it! So wonderful!!! Your coat is fabulous, this fabric is so lovely… Great job! I absolutely love this coat! The fabric is just divine and you look fabulous! ohhhh, so nice! I love the fabric and think it is so elegant with your flats and slim pants. Oh, I love Desigual on others, but I never seem to find something that´s got my name on it. It´s such a unique and cool brand, I think! 🙂 Starting to sew almost everything I wear has been a great style enhancer for me too, all of a sudden I can wear whatever I imagine! 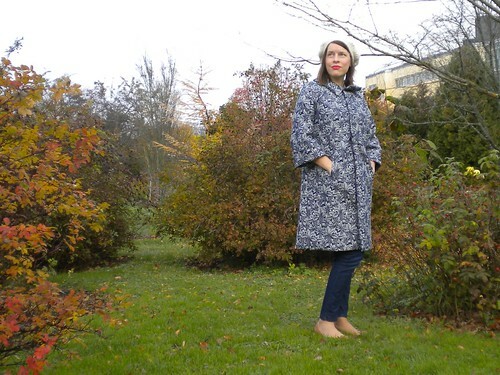 I love this style coat and it looks stunning in that fabric. It’s a beautiful coat and the fabric is wonderful. The line drawing of the pattern didn’t realy inspire me but I love your version. May be I need to go back over some of my Burda magazines.